If you've looked around the site you'll have seen that most of my original guitars are inspired by vintage models that I particularly like. I get most of my ideas for a new guitar when I'm building a guitar and this bass was no exception, while working on the Dina III Green Firebird I was toying with the idea of a violin style bass and started thinking about how I could make it a bit Firebird'ish. 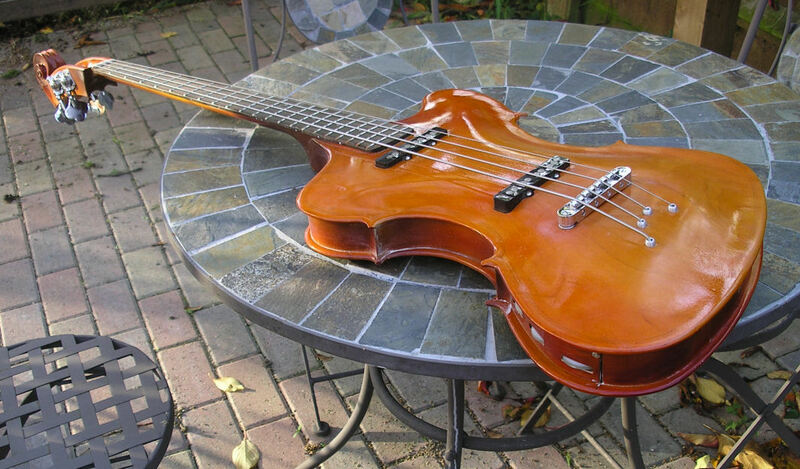 Obviously the Hofner violin bass was my starting point but I really wanted to bring it up-to-date and incorporate some quirky features that you wouldn't usually see on a "normal" bass. Planning something like this is a bit of a double edged sword, following a traditional design makes things a lot easier, placement of the hardware etc is pretty much set. This bass was quite the opposite, starting with a blank page, but then having all the decisions to make as to where to put stuff, what scale length etc. 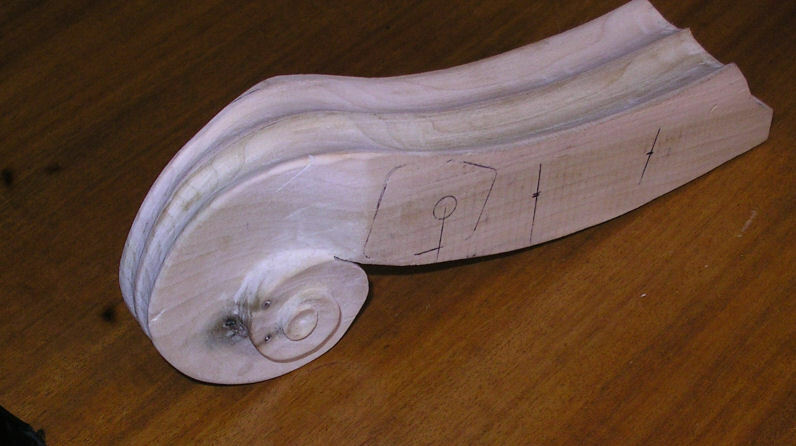 One great thing about hand making a guitar is that you are not restricted by having to consider manufacturing techniques, having to spend a few extra hours hand fashioning something that can't be done on a machine is not really consequential, but it's little details like this that can make a really unique guitar. There are so many quirky features on this guitar, some I thought of right from the off, others when I was planning and some quite late-on while I was building it. Let's get started with some pictures and I'll do a bit more explaining as I go along. 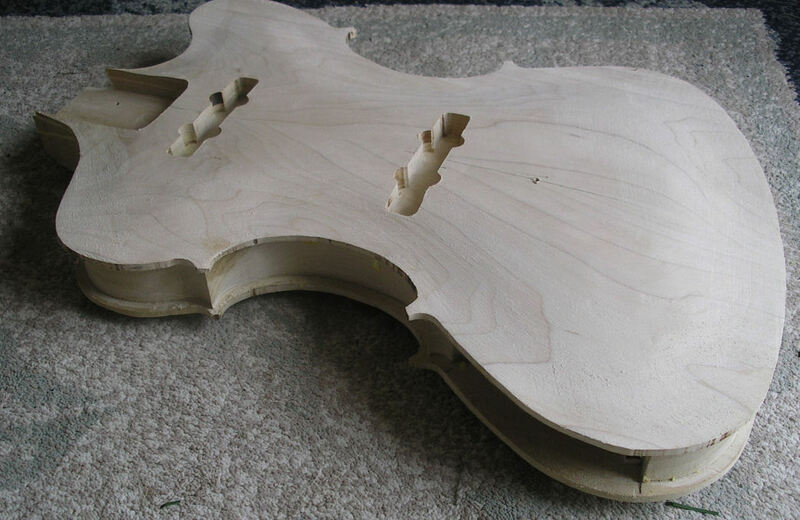 Here's the anatomy of the bass, I wanted it to be an arched top and back and have the body edges like a violin with the top and back overhanging the sides, It would have been impossible to make it from a single piece of wood so I decided to go for a semi hollow construction which also kept the weight reasonable. Roughly carved top, I used Tulip wood as it's light in colour which I guessed could be stained to a nice antique violin look. the carved arch had to be quite a strange profile to accommodate the scale length and not have a stupidly high bridge. All these things I'd planned before, big sheets of graph paper are useful! I was very conscious of not wanting to just build a violin shaped guitar, I know there's no getting away from the fact that it is a guitar! But there was things I could do to pay more homage to a violin, one thing was not to have any knobs on the top, the above picture shows the arrangement I used for the controls which fits into the side, quite bloody awkward to make! 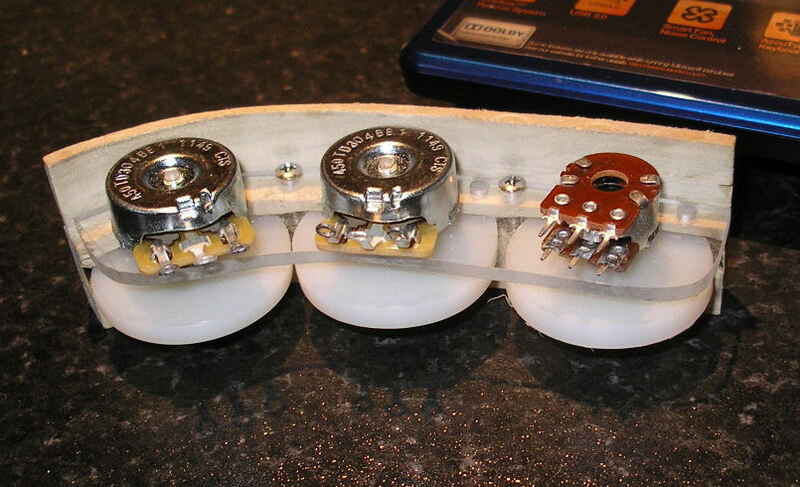 It would have been very difficult to incorporate a pickup selector switch so I used a blend pot and two volumes. like I was saying, one of those tricky things to make but worth it I think for the overall look. ... Remind me NOT to have any "great" ideas again!.... One of those VERY last minute changes, this was a whole lot more work than I ever thought. I was just going to use a Firebird reverse style headstock but then thought double bass and threw myself at it before really thinking... Oh well the end result looks good, but there was many a time I wanted to set light to it. 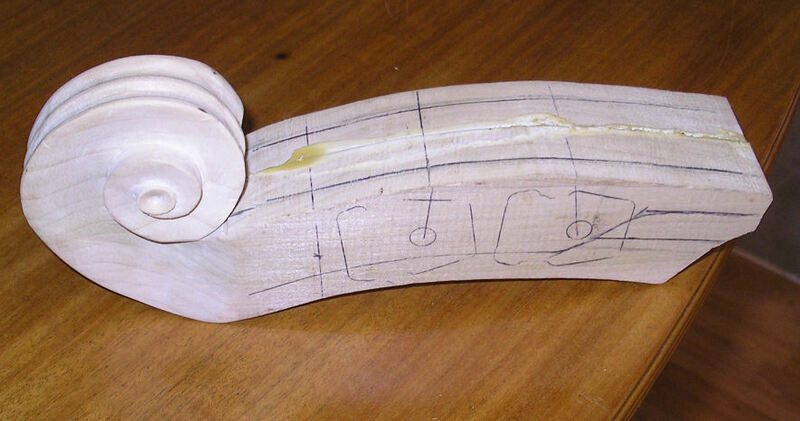 The carving goes on and on..
And after what seemed to be months of carving and sanding! The body starting to take shape, at this point I had designed it with a bolt-on neck but then changed my mind and decided on a glue-in, probably not the wisest thing but I just thought it would look so much neater. 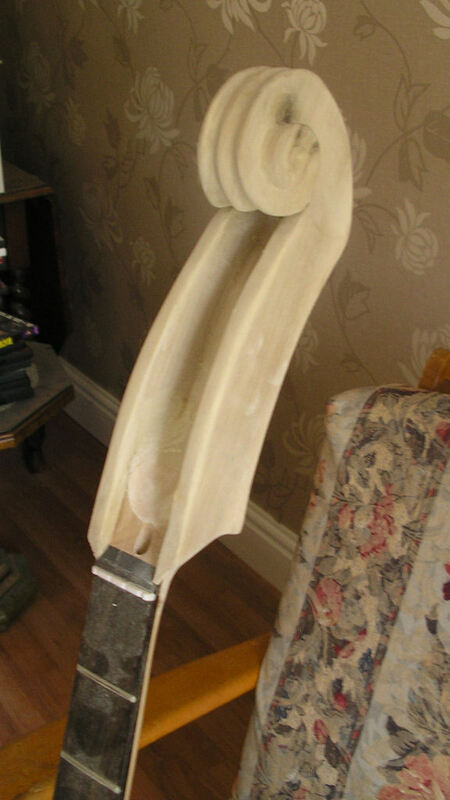 The edges were a real pain to do, as usual loads of sanding. I had a bit of a quandary regarding "f" holes, initially I was going to go for my stylized "swoosh" then I thought traditional "f" then due to the lack of space my final choice was not to have any at all. The bridge arrangement is a tunomatic with a string through body, getting close to being able to do the final finishing. You can see from the shine how different the body arch has to be to accommodate the bridge position, I guess I could have gone for a shorter scale length but I really wanted to have a Fender scale for versatility. 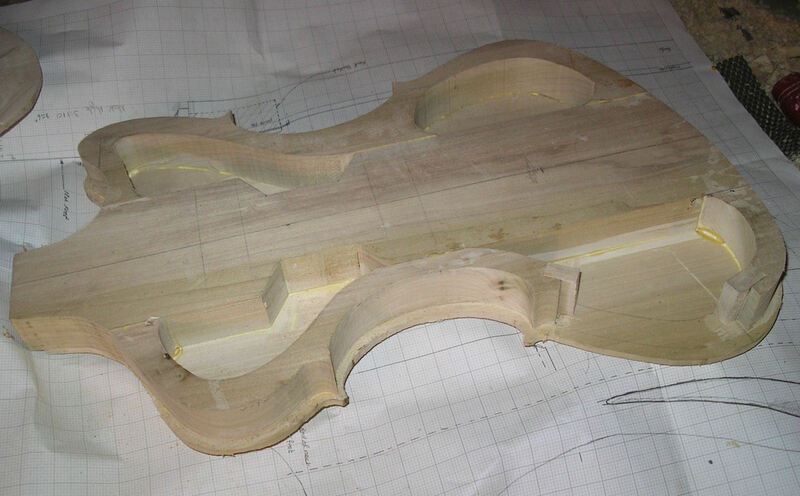 Some way to go on the headstock, I had to modify the tuners and work out how the hell they were going to fit. Bit of a jump to here, I managed to get quite a good looking antique looking finish. I had thought of trying to do a purfling/edge inlay but really had a struggle to work out a way to do it and for the same reason that I decided not to do "f" holes I just thought that it would be too fussy, after all the guitar (I felt) didn't need "anything else" in the end I thought keep it simple was the best option. This picture shows the controls and I do thing that it looks better not having them mounted on the top. 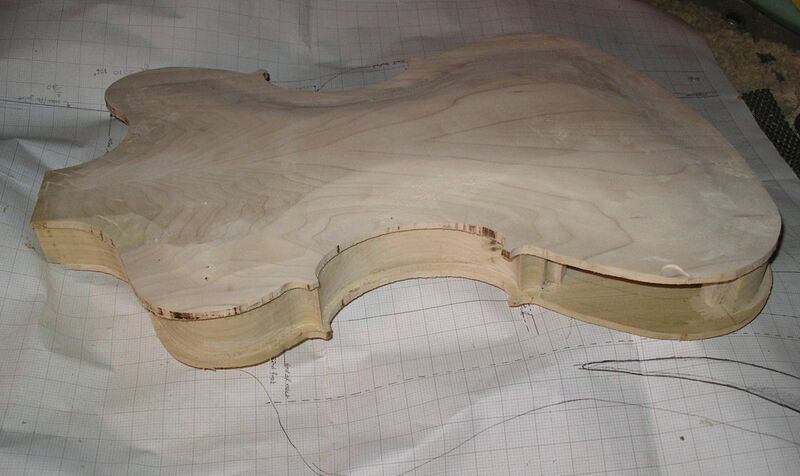 Here's the back.. As with all my guitars it's finished in nitro cellulose. To get the colour I mixed the dye in with the lacquer, this makes it quite a easier to get a consistent shade, if you stain the wood first it can look uneven depending upon how the stain soaks in the wood. I'm going to have to get some long strings for this guitar, what with the headstock and string-through arrangement the strings have to be quite long. Just about ready for a test drive, the string through body was made with off the shelf ferrules pressed into the back and thick walled aluminium tubing through the top. 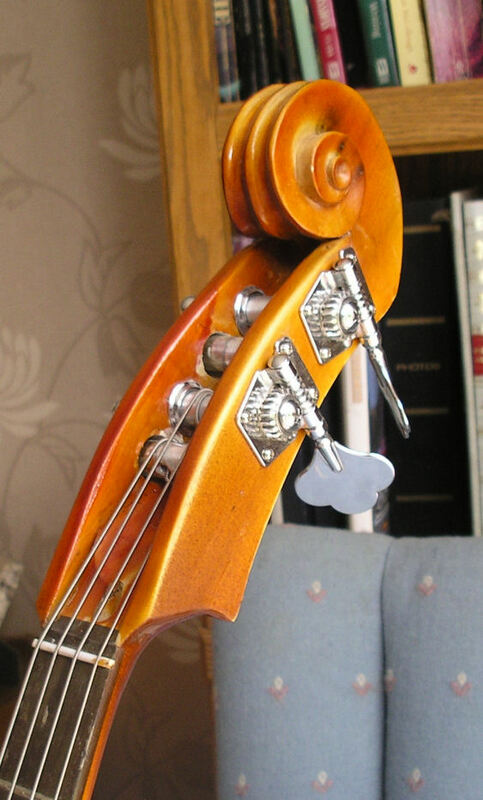 I do like this arrangement it saves having an ugly tailpiece and I think is altogether more solid. I also like the look of them if they're not in a straight line which is fortunate, letting a little secret slip, it's not very easy to drill holes exactly straight and precisely spaced through a thick piece of wood like a guitar body, small diameter drills tend to wander a little, there are a few tricks you can use to keep them straight but it's easier to place them in a curve! Still in need of flatting off and polishing again, as you can see in some photos I drew some parallel lines around the edge to look like purfling, I did lacquer over them but over time they've faded..Grrr, so I might have to revisit the finish again or there again just leave it. 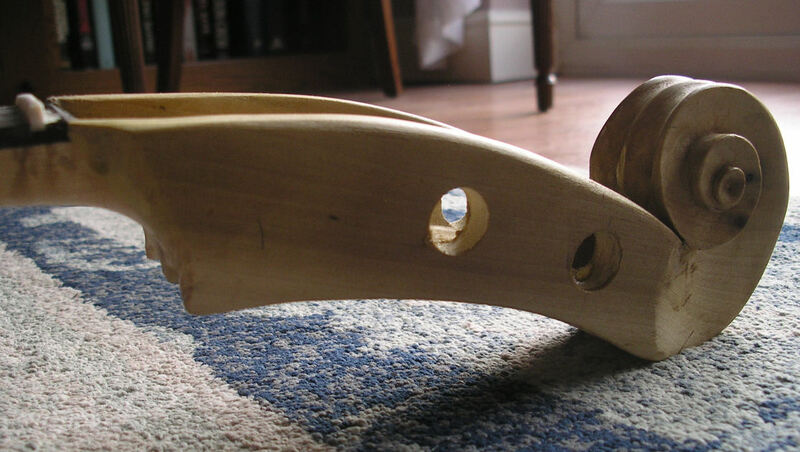 The neck was a commercially available item for a Jazz type bass, of course part of the headstock was removed and the double bass type scroll headstock added. I don't have the jigs to build bass necks and to be honest I'm not planning to either. Some of the "off the shelf" stuff is a very good price and I don't see the point in "re-inventing the wheel" just for the sake of it. There's a little further work to do to it which I will get done, but I find that customers sometimes want a particular set-up so much of the remaining adjustments I can do to suit the customer... In the meantime I'll just play it! 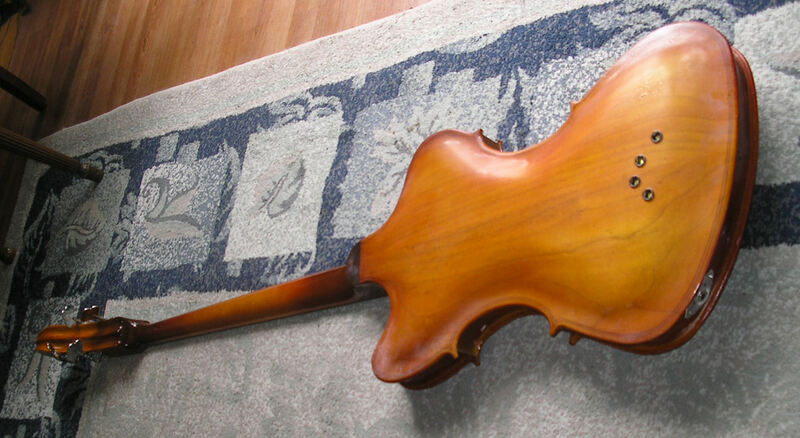 Unique violin/Firebird shape with arched top and back, semi hollow with solid centre core built from tulip wood, set neck. 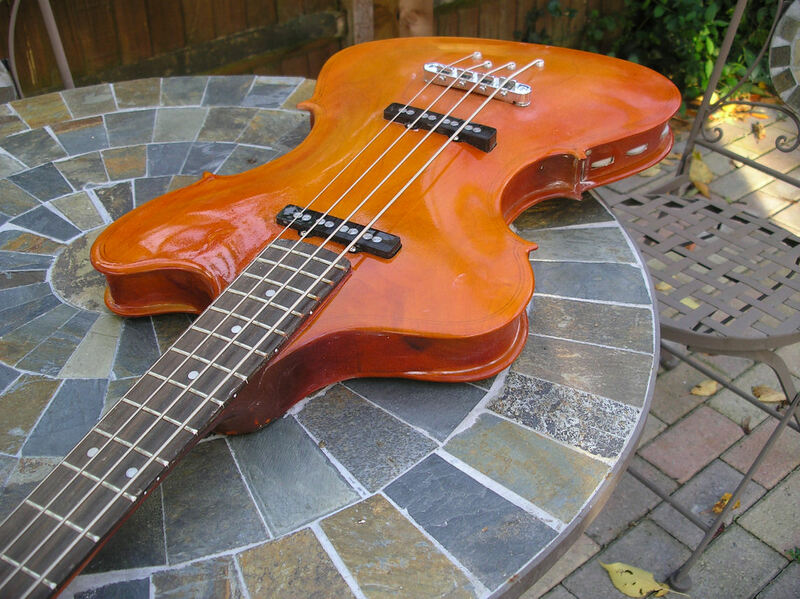 Standard Jazz bass style neck, maple with rosewood fingerboard, Double Bass style headstock. Seymour Duncan for Jazz bass. 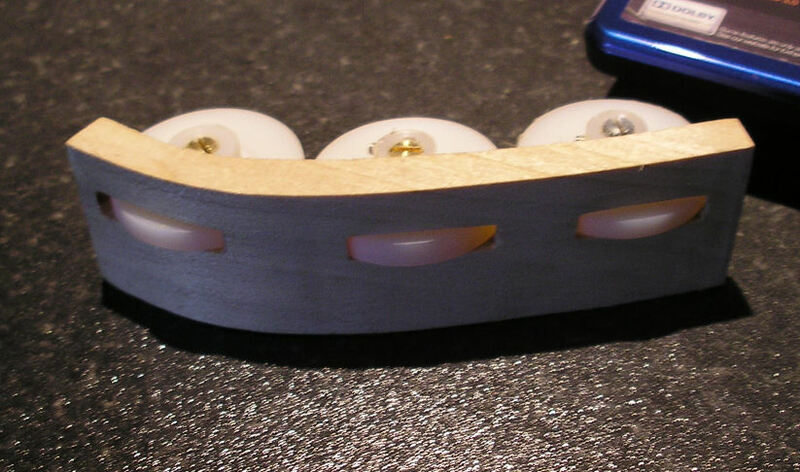 "Elephant ear" tuners, Tunomatic bridge, string through-body. So if you want to buy this unique guitar what do you get?.... Certainly a bit of a show stopper! 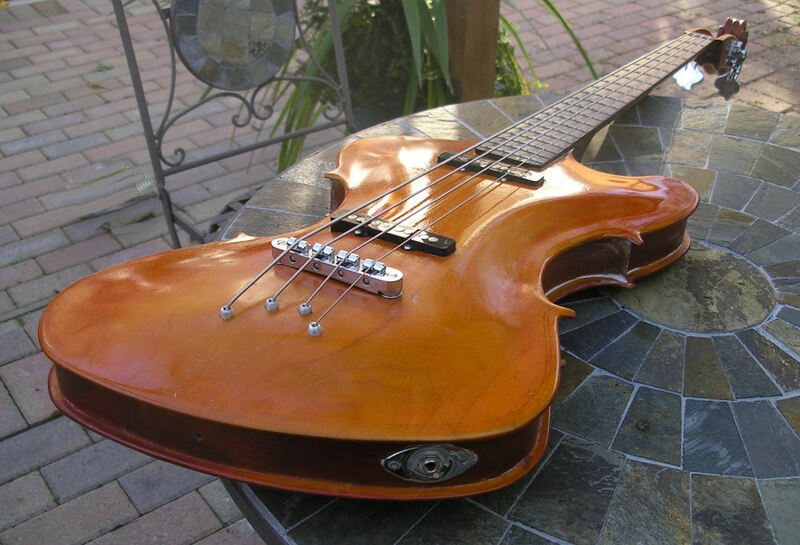 It plays pretty much like any Jazz bass type guitar would but is a one of a kind. 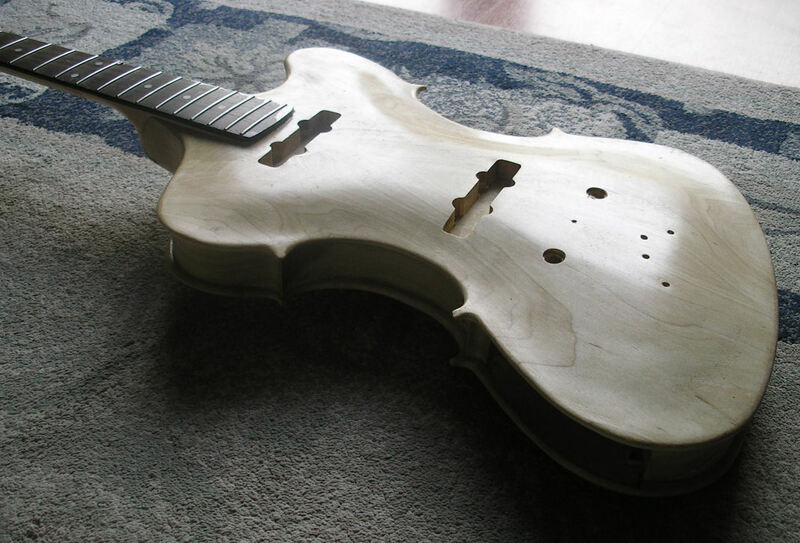 As I've described above, building the guitar was a voyage of discovery, a very odd body construction, they violin style overhangs on the top and back were very time consuming and I don't even want to think of the time it took to carve the headstock. As with all my builds it's a balance between time and money, I always expected that it would take a long time to build and have no illusions of charging a realistic price for it based on the build time. 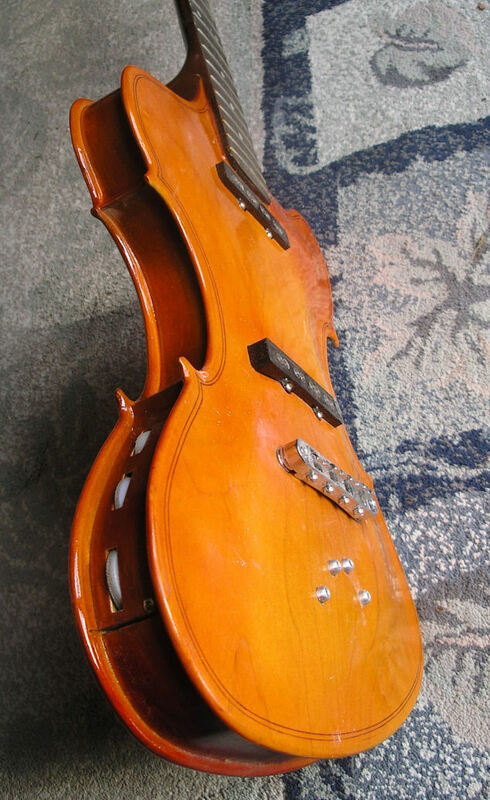 Please don't expect an "as new" finish it has a slight relic feel to it that suits the old violin look, spending the extra time to get a perfect finish would have made the project completely unviable. I LOVE building guitars and I can't keep them all, I really am not going to build another of these so if you want something unique at a bargain price considering the hours it took to build then look no further.